// an object as determined by the implementing class. // provides specific authentication requirements. // Potential response strings for the authenticate method. // string or status indication. // the negotiation is successfully completed. // object of a predetermined type. 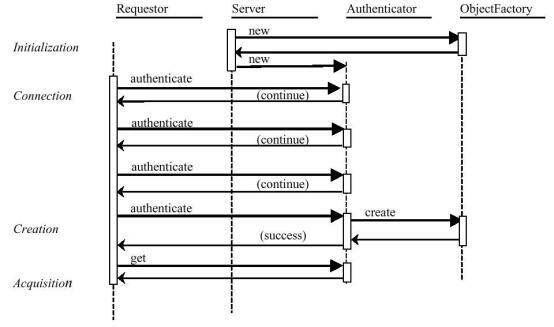 // authentication requirements and any other protocol negotiation. // using the get method. F. Das Neves and A. Garrido, "Bodyguard", Chapter 13 in Pattern Languages of Program Design 3, Addison-Wesley 1998. E.B. Fernandez and J. C. Hawkins, "Determining role rights from use cases", Procs. 2 nd ACM Workshop on Role-Based Access Control, 1997, 121-125. D. C. Schmidt. “Reactor: An Object Behavioral Pattern for Concurrent Event Demultiplexing and Event Handler Dispatching.” Pattern Languages of Program Design (J. O. Coplien and D. C. Schmidt, eds. ), Reading, MA: Addison-Wesley, 1995. D. C. Schmidt. “Acceptor: A Design Pattern for Passively Initializing Network Services.” C++ Report, vol. 7, November/December 1995. D. C. Schmidt,. “Connector: A Design Pattern for Actively Initializing Network Services.” C++ Report, vol. 8, January 1996. D. C. Schmidt. “A Family of Design Patterns for Application-Level Gateways.” Theory and Practice of Object Systems, J. Wiley & Sons, vol. 2, no. 1, December 1996. D. C. Schmidt. “Acceptor and Connector: Design Patterns for Initializing Communication Services.” The 1 st European Pattern Languages of Programming Conference (Washington University technical report #WUCS-97-07), July 1997. “Java Remote Method Invocation.” Sun Microsystems, Inc., Redmond, Washington, 1977.